A recent survey funded by San Diego’s West Health Institute found that 65 percent of Americans are extremely or very concerned about the ever-growing cost of prescription drugs. That concern is well placed. The latest Vizient Drug Price Forecast predicted in July that overall drug prices will increase nearly 5 percent in 2019. And it’s clear, according to a recent Kaiser Family Foundation analysis, that out-of-pocket spending on prescription drugs is expected to sharply increase in coming years. “We’re seeing these overall price increases, and we’re also seeing new brand name drugs come on the market with very high price tags. That results in a significant contribution to the overall high cost of health care,” said Timothy Lash, West Health’s chief strategy officer. Everyone is pretty clear that they want these price increases to stop, and yet everyone also wants access to the latest miracle drugs, such as immunotherapy for cancer, that often costs $100,000 per person or more. 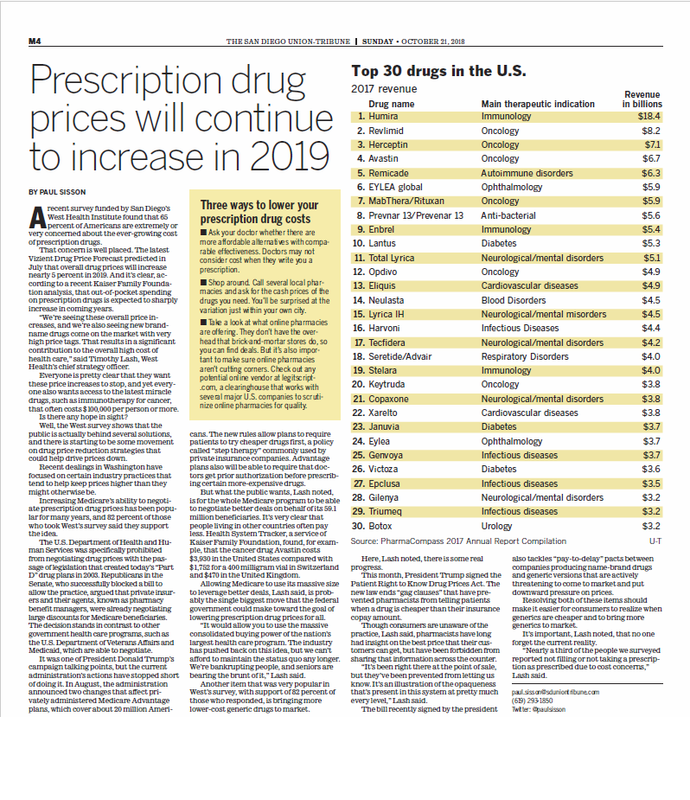 Well, the West survey shows that the public is actually behind several solutions, and there is starting to be some movement on drug price reduction strategies that could help drive prices down. Recent dealings in Washington have focused on certain industry practices that tend to help keep prices higher than they might otherwise be. Increasing Medicare’s ability to negotiate prescription drug prices has been popular for many years, and 82 percent of those who took West’s survey said they support the idea. The U.S. Department of Health and Human Services was specifically prohibited from negotiating drug prices with the passage of legislation that created today’s “Part D” drug plans in 2003. Republicans in the Senate, who successfully blocked a bill to allow the practice, argued that private insurers and their agents, known as pharmacy benefit managers, were already negotiating large discounts for Medicare beneficiaries. The decision stands in contrast to other government health care programs, such as the U.S. Department of Veterans Affairs and Medicaid, which are able to negotiate. It was one of President Donald Trump’s campaign talking points, but the current administration’s actions have stopped short of doing it. In August, the administration announced two changes that affect privately administered Medicare Advantage plans, which cover about 20 million Americans. The new rules allow plans to require patients to try cheaper drugs first, a policy called “step therapy” commonly used by private insurance companies. Advantage plans also will be able to require that doctors get prior authorization before prescribing certain more-expensive drugs. But what the public wants, Lash noted, is for the whole Medicare program to be able to negotiate better deals on behalf of its 59.1 million beneficiaries. It’s very clear that people living in other countries often pay less. Health System Tracker, a service of Kaiser Family Foundation, found, for example, that the cancer drug Avastin costs $3,930 in the United States compared with $1,752 for a 400 milligram vial in Switzerland and $470 in the United Kingdom. Allowing Medicare to use its massive size to leverage better deals, Lash said, is probably the single biggest move that the federal government could make toward the goal of lowering prescription drug prices for all. “It would allow you to use the massive consolidated buying power of the nation’s largest health care program. The industry has pushed back on this idea, but we can’t afford to maintain the status quo any longer. We’re bankrupting people, and seniors are bearing the brunt of it,” Lash said. Another item that was very popular in West’s survey, with support of 82 percent of those who responded, is bringing more lower-cost generic drugs to market. Here, Lash noted, there is some real progress. This month, President Trump signed the Patient Right to Know Drug Prices Act. The new law ends “gag clauses” that have prevented pharmacists from telling patients when a drug is cheaper than their insurance copay amount. Though consumers are unaware of the practice, Lash said, pharmacists have long had insight on the best price that their customers can get, but have been forbidden from sharing that information across the counter. “It’s been right there at the point of sale, but they’ve been prevented from letting us know. It’s an illustration of the opaqueness that’s present in this system at pretty much every level,” Lash said. The bill recently signed by the president also tackles “pay-to-delay” pacts between companies producing name-brand drugs and generic versions that are actively threatening to come to market and put downward pressure on prices. Resolving both of these items should make it easier for consumers to realize when generics are cheaper and to bring more generics to market. It’s important, Lash noted, that no one forget the current reality. “Nearly a third of the people we surveyed reported not filling or not taking a prescription as prescribed due to cost concerns,” Lash said.